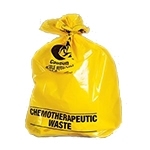 ChemoPlus™ Waste Bags are an economical way to dispose of soft goods associated with the chemotherapy process including gowns, gloves, head covers, shoe covers, low lint towels and masks. Easily identifies chemotherapy waste by its yellow color. 4 mil thick for increased strength and durability. Closure ties included. 15 gallon capacity.